My plan in South India has been no plan and so far it has worked out pretty well for me. I just follow the recommendations of others traveling around India like me. A couple of my new friends recommended that I go to Auroville. The name for some reason did not appeal to me at all, perhaps it sounded too “western” and when I read about it on the Lonely Planet guide, they made it sound like an expat enclave. But I still decided to give it a try, trusting my highly-spiritual and wise friends Jake and James from the UK. To begin to understand Auroville, first imagine a political figure named Aurobindo, fighting for India’s independence who ends up in jail and during his year in captivity has a great spiritual realization. Through his yoga, meditation and reading the Gita and Upanishads he became concerned with the future of humanity as a whole. He felt a divine order to develop what became to be known as “integral yoga”. This yoga has the goal of embodying the next level of consciousness for the world, the yoga of terrestrial transformation; which goes beyond the “mental man” to the “supramental”. So if I try to understand and summarize what I have learned… the universe has gone through different stages of consciousness or evolutions, from single-cell organisms, to plants, to the world of feeling- when animal appears, to the discovery of the mind (intelligence) when man appears. But this is not the last stage; we have yet to reach the next stage of divine consciousness or the “supramental” consciousness. This is when we reach a level of awakening where all matter is joined to the Divine force (above). And because as human beings we have intelligence, for the first time we are able to actively participate in the current stage of evolution and help ourselves reach the next one quicker. There are essentially two parts to it, first the inner-work of one’s own level of consciousness and second, the collective work to form a future society (ready for the next stage) and that works together to speed up the process of evolution. One of the elements needed in this future form of society is “Human Unity”. So the city of Auroville is a sort of an experiment that has become the manifestation of this human unity and collective society. So in 1914 Sri Aurobindo meets “The Mother”, a French traveler who had seen Aurobindo in her childhood visions. She was an already highly spiritual being who had visions of the past and future from a very early age. They were like spiritual soulmates who worked together for various decades running the ashram where the integral yoga is practiced, located in Pondicherry (12km from Auroville). When Aurobindo passes away, The Mother is left with the task of seeing the realization of this society come to life. The city of Auroville is then founded by The Mother in 1968. According to local literature this city has representatives from 124 countries and 23 Indian states who have been working together for the past 40+ years to build this place where religion, creed and color are left at the door, where people have a sincere aspiration to live as free citizens of the world, and where people strive to live in peace, concord, and harmony focusing on a community life and only obeying to the single authority of the supreme truth. The city consists of 90 settlements where 1700 people from India and 35 other countries live and work together on difference projects. Each settlement has a specialty including research into a cashless economy, environmental regeneration, organic farming, renewable energy, permaculture, village development, and other small scale industries that give employment to thousands of inhabitants in the surrounding villages. In the middle of the city, where it all started, you find a Banyan Tree; which is considered a spiritual tree in India and where the Matrimandir was constructed. The areas surrounding this structure are still under construction. 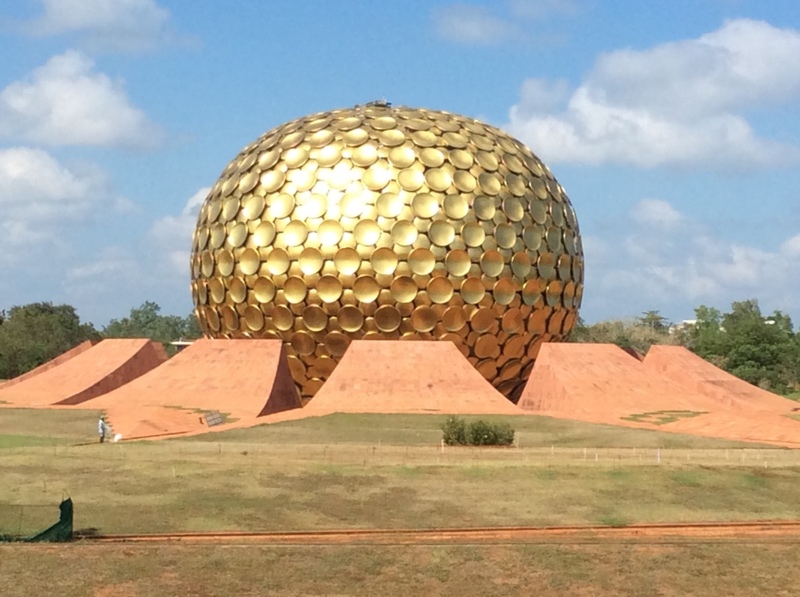 The Matrimandir structure looks like a golden giant golf ball. It is meant to represent the manifestation of the supramental consciousness. This is where people go to do their concentration work, to find the Divine consciousness. Outside you also find twelve petals or meditation rooms around the giant golf ball structure. These are meant to represent the twelve virtues of The Mother. View from the side of two of the petals. You can see the entrances into them. Visitors have to request a special pass to view the Matrimandir from outside and if you are serious about going inside to do concentration, then you have to go to a different office to request an appointment on a later day. And if you are still serious about your inner-work, then you can request to visit one of the petal meditation rooms from another office situated at the Matrimandir complex. You can request appointments for as many days as you like. Each time you visit the meditation petal rooms, you can also enter the Matrimandir to visit the concentration room again. I was able to get appointments to visit the Matrimandir and the petal rooms on three different days. These rooms are very silent, clean (everyone has to wear socks that are provided there) and peaceful; perfect for meditation. Some people say they feel an incredible energy inside of this place. For me, I just felt silence and peace. The meditation room for the virtue of “Courage” inside one of the petal rooms. The circles are the mats to sit on the floor to meditate. I ended up spending a week in Auroville, biking around the town, trying different yoga classes, different therapies like Energy Healing, Hormonal balance yoga (Aviva), visiting the art exhibits, enjoying the music festival, trying out some of the delicious organic food and enjoying the company of my awesome new friends Sofia, Camila and Paola from Colombia and Alex from Canada. Hoping to learn more about projects taking place at Auroville, we attended a talk that was open to everyone. It ended up being an annual meeting for the Auroville International group or AVI. These are people from Auroville that live in other countries most of the year, who work to promote the ideals of this city, learn about new projects going on outside to bring them to Auroville and trying to help people that want to come to live in the city, including students looking for internships there. my new friends from Colombia, Camila, Sofia and Paola. I did not spend enough time in Auroville to give you an educated opinion of whether this project towards Human Unity is working or not. What I can tell you is that this is a nice place where anyone is welcome and any contribution given (through work, volunteering, or just being a tourist) is well received. It is a nice community where Indians and mostly expats come together to try to live a simpler and more spiritual life where research, education and yoga are highly practiced and valued. The adult generations currently at Auroville seem to be working hard to make this place become the full realization of the dream of Sri Aurobindo and The Mother. And perhaps the newer generations, the children of these older Aurovillians, will be the ones to live in true harmony and achieve the desired human unity. Right now, it is definitely good work in progress.